Find out what types and sizes of shipping boxes are available. Choose the right box to avoid damages! Do you know there are different types and sizes of shipping boxes? What Fits in a particular moving box? When you are relocating from one location to another, depending on the distance and the fragility of the items, you should decide the type of packaging each item would need. It is very simple to pick up cardboard packaging available at a local store used to pack their merchandise. However, it may not serve your purpose at all. Also it will not give you the right protection for your household items. You also need to take into account the destination. For example if you are shipping boxes to Australia or New Zealand using second-hand or dirty cartons may expose you to addition fumigation, repacking, cleaning or quarantine costs. Let us discuss in brief about the packing cartons that are available for sending household goods, including their dimensions and what purpose they are utilized for so that you can make your choice based on the solid information. Whether you are an international moving company or merely a person who wants sending boxes to move the home or office contents, you should always choose the right kind of packing boxes for moving. There are many types of boxes available in the market for sending particular items. Some cardboard shipping cartons are fit for sending hard materials, kitchen utensils and other materials. Whereas some packing boxes are fit for moving fragile things and items like lamps, TV sets and other electronic equipment. Some packaging are strong and durable allowing you to pack even 50 kg into one box. And some are week and should be used for loads weighing less than 20 kg. You should have an idea about which box is the best fit for certain things. Here we will be suggesting the perfect size for everything you may want to ship. Understand the things that you need to pack, their weight and their fragility. Based on that, you need to choose the size of the box and also pick up the required padding and waterproofing. Of course, all this must to be done by you since you love your stuff and do not want it to get crippled. Below you can see different types of sending boxes, their sizes and usage. You will find out what items you can put in particular packing box. As you can see in your house, everything has a different shape and size. So the moving boxes should also be consistent with those sizes. Suppose you want to ship books and some other small quite heavy things safely. For such items you should choose small packing boxes for shipping. These sending boxes are available in standard size of 15x10x10 (LxWxH). Along with these cartons, you can also get medium size packaging. They will be useful to move medium size things, like shipping electronic equipment, TV set, Music system, computer and some other things. 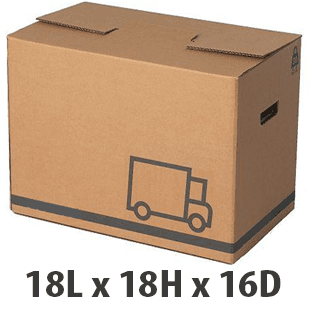 These packing boxes for shipping are available in 18x10x10 and few other similar sizes. 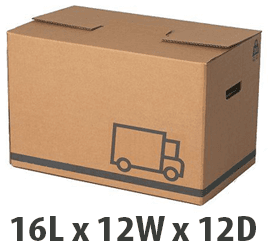 If you don’t want to walk to the storage and moving boxes shop, you can also buy these strong cartons for moving house online. Just pick your laptop and start searching online. 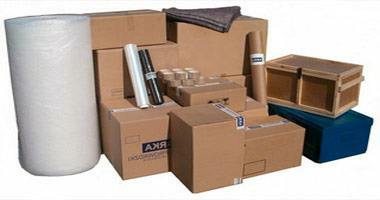 The best packing boxes for shipping also come in large and extra large sizes. The large sizes are perfect to send many things simultaneously, like a bunch of clothes, whole study materials and some other large things, which you want to move safely. 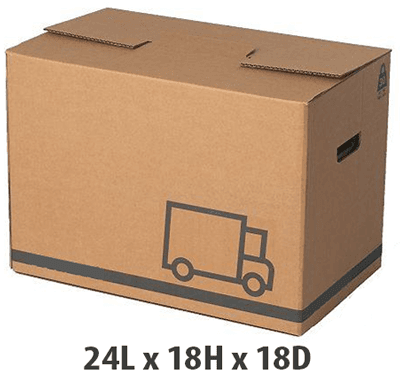 You can purchase these cheap shipping boxes in size of 20x20x15. If something is bigger than this size, like freezer, cupboards and washing machine, you can move them in extra large size cardboard cartons, specially designed for large and heavy household goods. Small packing cartons – These are designed for heavy items that are not tremendous, examples are Books, CD. These small packing boxes may not hold a lot of stuff, but when carefully packed there would be no damages to your precious collection of books and songs/movies. The dimensions of the box are 16L x 12W x 12D. The weight that this box will be able to handle is about 37- 50 pounds. When packing CD’s, for example, you can add exactly 144 CD’s in this box. You can also utilize this box to pack canned goods that are on the heavier side; however, as long as they are on a 50-pound limit it should not cause any problem. This box is also known as the 1.5 CU FT box. The reason we keep specifying the weight that each box can hold, and the amount of items to add is because, it’s tested to keep the box and its elements intact. So it is important that you follow the instructions in mind whatever has been provided. For the environment-friendly people, these cardboard cartons for moving also come in recycled material. What I would recommend is that instead of just throwing away these small boxes you should store them or pass them to anyone who is moving. This will ensure that you are environment conscious as well. Medium boxes – These are also known as three cubic foot box (3 cubic ft). This table is useful to take kettles, pans, clothing and small electronic items. This is one of my most desired shipping carton as it holds most of the bulky items. However, the dimensions are such that it will not be too heavy to carry. The Sizes of the case are 18" x 18" x 16”. Most standard items that are packed in this box are Kitchen items. This is because the pots and pans are heavy. However, they should also be packed with care as they may get damaged or dented. The reason we keep specifying the weight that each box can hold, and the amount of items to add is because, it’s tested to keep the box and its elements intact. So it is important that you follow the instructions in mind that have been provided. This box can carry weights up to 60 pounds. So make sure you keep the Max weight in mind whenever you are using this kind of shipping boxes to Australia. These cardboard cartons can be used for delivering items to OZ from UK however are not to be used for long-term storage. Large moving box – Also known as 4.5 cubic foot box, what is essential is that as the box gets bigger and bigger the lesser fragile items should be packed in them. So this type of sending box is ideal for your blanket, woollens, lamp bases, toys, unbreakable kitchenware and linens. Large packing boxes for shipping are ideal for people who keep items in storage with the hope that they would be used at some point of time. We are not suggesting to get rid of stuff that you are not using right now. All we are stating is that you should enlist the things that you have and for items that are plenty and not very substantial it is suggested that you use the large moving box. The dimensions of this box are 18" x 18" x 24" (4.5 Cu/ft.). Another set of items that you can store in large boxes for shipping are toys. Again, when getting these things it is important that you know what your storage requirements are. The reason we keep specifying the weight that each box can hold, and the amount of items to add is because, it is tried and tested to keep the box and its elements intact. So it is essential that you follow the instructions provided. For the environment-friendly people, these sending boxes to Australia also come in recycled material. What I would propose is that rather than just throwing them away you should store them or pass them on to anyone who is moving. This will ensure that you are environment conscious as well. Extra large moving boxes for shipping to Australia form UK also known as 6.0 cubic foot box – this extra large cardboard box for moving needs to be used with caution and care. The box is for items like pillows, larger blankets, cushions, rugs, stuffed toys, and coats. For some of the larger items like comforters, you can also buy a 6.1 cubic foot box. Here is what most people feel; by buying larger cartons online they will save cost and space. However, if your box is filled with more than allowed capacity and weight, then it will be difficult to carry. The items inside may also get damaged. Sometimes it can also lead to the cardboard box getting damaged. The best articles that you can carry in this box are blankets and pillows. These are huge items however they are not bulky so one box will allow for a lot of items. The dimensions of this box are 23 x 23 x 16 inches. Extra large shipping boxes for moving house are also called Euro pallet boxes. They are very useful if you do not need the full container shipping service. You should never over pack. Always ensure that the cardboard boxes for moving are not over-packed and not stuffed. This again is for the protection of the items in the box. It is also better if you add waterproofing materials with this kind of packaging as the blankets and pillows may tend to get damaged due to weather. What is also significant is the fact that these cardboard containers are not for long-term storage. 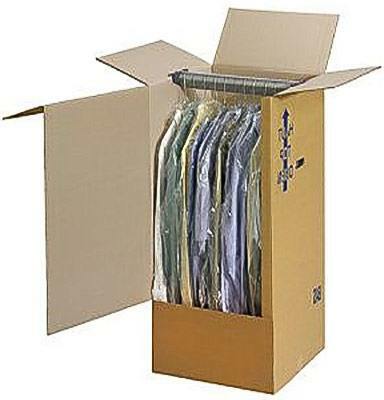 If you are moving into your new house and don’t want to damage your ironed clothes, then wardrobe boxes will be ideal for moving clothes. These cardboard cartons come with hanging bar on which you can hang your clothes and move them safely without any tension. Nowadays almost individuals prefer these cupboard boxes to move their clothes. Wardrobe moving boxes also known as hanging cartons are built like a wardrobe. And you can hang your clothes in them while carrying; of course, these don’t pack a lot of clothes. So ideally you can use this to pack things that cannot be moved flat and needs to be hung. May be expensive clothes and coats. This box is like a half closet. This carton is designed to carry hanging clothes. It also looks exactly like a wardrobe. When packing boxes is but it is best if you decide on the amount of clothes you have and then decide on the number of cartons you need. It comes with metal hangers and can be used to keep clothes later, but not in the long term. This can also double to store the shoes at the bottom of the closet. So when kept straight you can have clothes and shoes. The dimensions of this packing box are 24" x 24" x 40". Also keep in mind the weight of the clothes and do not over stuff if you do the damage would be imminent. The reason we keep specifying the weight that each box can hold, and the amount of items to add is because, it’s tested to keep the box and its elements intact. So it is important that you follow the instructions in mind whatever has been provided. For the environment-friendly people, these moving cartons also come in recycled material. What I would suggest is that the alternation of just throwing away these cardboard crates you should store them or pass them to anyone who needs to be shipping boxes to Australia from UK. This will ensure that you are environmentally conscious as well. Fold down the bottom flaps and close it with a tape. Bring it back upright and Insert the metal hanger in the slots that are available. After this place, the clothing along with the hangar inside and then close the lid shut and seal the flaps. These cartons are prepared primarily to move kitchen stuffs. For example, you want to move the glass made kitchenware safely to a new house and also fragile Chinese Pottery, and then you can choose sectioned kitchen boxes to move kitchenware. You can get kitchenware moving boxes to Australia in many varieties, but remember all these cartons are strong enough to move safely. Kitchen items sending boxes are also known as Multi-layer dish packing cartons. This is the type of the cardboard hulk that is best for international packing of delicate kitchenware, as they are multi-layered. You can also use these packaging for packing and shipping antiques as well. So here is what it does, ensures that the kitchen that is the most important part of the house packed well. There are individual sending boxes for Dishes, glasses, wine bottles and so on. So each pack allows you to pack specific items, ensuring that the fragile items are safe. Dimensions of the box are 24” x 12" x 11" (1.85 Cu/ft.). You can use these kitchen utensils boxes for multiple types of dishes by just making sure that the packing is done right. After that, you can have your plates, bowls and also add little silverware in the same box as long as you pack it enough. Here is how the packing should be done. It is very necessary that you have a lot of foam and paper to wrap the kitchen items. The strong kitchen packing boxes for shipping are on the heavier side. However, this will keep your fragile dishes from cracking or breaking. The house owners often feel stress about moving fragile stuffs, like mirrors and pictures. You cannot keep these things below any hard thing and also can’t carry it with you in your hands. So you should choose mirror and picture boxes, which are prepared to provide enough safety to such fragile stuffs. 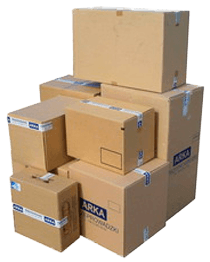 These are some of the most essential types of cheap moving and packing boxes for shipping; you can change their sizes and add additional length to the box. What you need to keep in mind for a fact is that you should use a sufficient amount of bubble wrap to protect your mirror or picture-packed with them. This is one of the most important cartons, especially if you are an art enthusiast. You might have several pictures and very expensive ones too; in that case this is the box for you. These cardboard packing boxes have sliding pieces that fit the artwork perfectly. It should be of a particular shape; reason being that only the cartons and the bubble wrap is not enough. If there is room in the carton for the object to move, it may cause damages. When packing the mirror or picture frames, it is not enough to use the packing box. It is important that you use a lot of the bubble wraps. Apart from this there are also lamps that require a special type of packing. Pull all the flaps on the side and seal it shut with tape. Do this for all parts available. Add the sections that are required for the article and its size. Then close it with a seal. Having a flat LCD screen TV has become a common fashion these days. As you can see in the case of picture frames, these TV sets are also fragile to move. Usually, we get these TV sets with their cartons, but if your original TV packaging is broken, then what will you do? Simply purchase a TV shipping box, which offers great safety to LCD screen and CRT tube TVs. For sure you do not need to worry about the safe movement of your TV set. These are specific packing boxes for sending TV to Australia. They are double walled and also have seals that can be closed with tape to make the moving more secure. It is important that you start by using bubble wrap as well. After the packing is done, you should ensure taping all the sides for the safety. You also need to consider what kind of a TV you are packing, if it is a tube, LCD, LED or plasma. The reason we should consider is because depending on the type of TV extra packing would be required. Plasma and LCD are more fragile and would be best if we use extra bubble wrap. You should use special boxes for sending TV to OZ. Do this for all sections that are available. After this bubble wrap the TV as much as required. Add the sections that are required by the size if your items and then close it shut with a seal. It is the most usual thing to see that lamps are always broken while shipping goods. It happens because lamps are very fragile and after breaking they seem useless. You can take lamp shipping boxes, which are specially made to send lamps. Thus, no more lamps will be broken during shifting of your home. If you are a working person and you keep your office files at home, then you should get file boxes to move them. Thus, you can provide safety for all your files and not lose them. Why lamp box most people would say? Well, it’s important that these lamps are packed well. The reason being the lamp is quite weirdly shaped to fit in directly, so there have to be split into multiple parts and then pack it. Ensure that you have enough packing material to ensure the lamp is not damaged. The Dimensions are 12" x 12" x 48". These are, of course, for people who have lamps at home as other types of items may never fit this box. The Lamp would be split and packed in separate cartons. 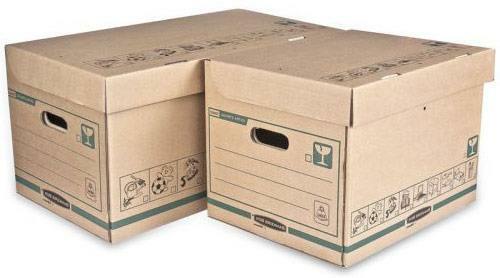 File and documents packing boxes are ideal for packing office supplies and paper. You don’t need special packing for these cartons. Just directly put the paper in and close the lid. They almost resemble a tote handle to conveniently transfer. Dimension 16 3/8" x 12 5/8" x 12 5/8". These are mostly used for carrying legal documents and paper. Other sending boxes to Australia from UK – you will also find other types of packing cardboard cartons varying in size as per your requirements and the need of the item that will be packed. You can use some standard box sizes, but you should better consult an expert in packing before deciding anything for yourself. These type of moving boxes list is not a comprehensive list, but simply about the essentials so it would be best if you do not decide just based on what I have written. All the cartons for moving I have mentioned above are available to purchase online. 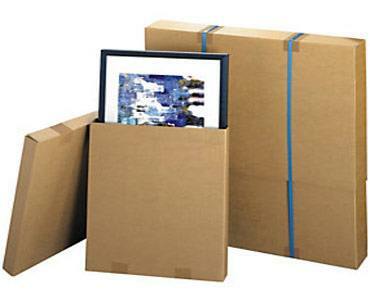 If you want to have safe moving of your home, so you should buy these cartons. Open the moving boxes retail website and then choose cardboard packing cartons according to things you have in your home. For sure, you will easily get cartons of your required sizes. No more fragile items will break while shifting and thus you will save money on removals insurance. These sending boxes from UK are reusable, and you can use them many times, if you will keep them safely after picking the things out. You can choose regular cartons to move articles of your house, but in the end you will face the same problem. There will be danger of breaking things, and you can reduce it by choosing safe and secure moving boxes according to each thing particularly. Contact us to find out how much is to ship small, medium or large boxes to Australia from UK. Obtain shipping costs for different numbers of boxes and choose the right option for you. I am making initial enquiries for shipping personal belongings in the middle of August. I have never needed to do this before and am unsure of the best way to go about it. I will be leaving the UK and the goods to be shipped before I have an address to send them to in Australia, but will need to package them ready for collection before I go. Time isn't essential so I think sending boxes by sea freight would be best. I am unsure of the cheapest or easiest way to package and send my belongings. I estimate there to be about 200kg in total weight of various items and power tools in boxes, which should make up around 1 cubic metre. Would it be best to put all belongings into one wooden crate, or to make several individual shipping boxes? I can makes either crate or boxes to suit the various items but do not know if there are any restrictions on sizes or weights, e.g. due to an individual lifting and shipping the boxes opposed to one crate that will need mechanical handling. Also I'm not sure if the individual boxes or crate would need to be of standard sizes for stacking purposes etc. Could you also tell me if it would be beneficial at all to pick up the boxes/crate direct from the port rather than have them couriered to a private address in Australia as it wouldn't be a problem for me to collect them from the port. Best way is to use shipping boxes and placed them in a wooden crate. The crate can be sealed and there will be no chance any of your boxes will get damaged or stolen.